It's not even half-over yet, but 2010 has already been a monumental year for OK Go. In January, the quartet released Of The Blue Colour Of The Sky, its first album of original material since 2005's Oh No. A marked departure from their earlier records' Weezer/Cars/Pixies pastiches, Colour finds OK Go channeling Prince and Parliament-Funkadelic through the filter of producer Dave Fridmann's grandiose psychedelic sound. The result is a funky, danceable album that bears similarities to Fridmann's work with the Flaming Lips and MGMT, but still retains OK Go's pop smarts and peppy personality. In addition to tweaking their sound, the treadmill kings continued their tradition of making innovative videos with their Rube Goldberg machine clip for "This Too Shall Pass." The video arrived with some controversy, as OK Go front man Damian Kulash voiced his displeasure with the group's record label EMI over their policy that prohibited the clip from being embedded on websites in a New York Times Op-Ed piece. Since then, OK Go and EMI have parted ways and while both parties claim the split was amicable, a Billboard cover story on the band implies that the separation wasn't entirely on good terms. The band is now operating on their own upstart called Paracadute. OK Go is currently in the middle of a 33-date North American tour. 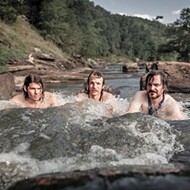 In preparation for the band's April 18 show at the Old Rock House, A to Z chatted with Kulash about his band's new direction, the merits of starting its own record label and the new album's connection to The Influence of the Blue Ray of the Sunlight and of the Blue Colour of the Sky, a book published in 1876 that posits that blue light has healing powers. Bob McMahon: Listening to your new album, it's obviously very different from your last two, and I was curious what prompted this new sound/new direction. Damian Kulash: It's a different style of writing entirely. Our first couple of records, I think we made sort of the way you write prose. You like to think of a thing you want, then you parse out the words and try to arrange them grammatically and then out comes a sentence. And those records were sort of goal-oriented. We kind of imagined the song and then tried to get to it. And on this record it was different. We started with very simple musical elements and just played around with it until something emotionally resonant kind of jumped out. In those moments when something like that happened, we sort of chased that down and figured out where the song went behind it. And so instead of having an endpoint we were shooting for, it was kind of like just following where the car wanted to go kind of thing. So it was more of a conscious attempt to write differently and things came out differently? Well, yeah. We started by writing the same way we had in the past, we just didn't like anything that we had written. We had been on tour for 31 months on our last record and after two-and-a-half years of playing every night, the things that push your buttons emotionally change a lot. We got back in the studio at home thinking, like, "Turn up the amplifier and prepare to get yourselves fired up!" And out comes the windmill guitar and it's just not exciting anymore. We just extended that particular type of catharsis to ourselves. With that long tour and this exhaustion with that sound, is that why it took five years to release a new album? Yeah. We've been touring for the better part of five years and two-and-a-half straight. And while the first two records are pretty different from each other in a lot of ways, they certainly were written very similarly, a kind of similar songwriting style. It was time for something new.